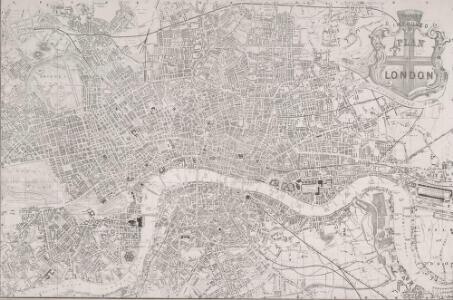 Description: The title of this map appears at top right alongside the publisher’s imprint (in shield) and the city arms. The map is divided in half-mile squares with letters and numbers for reference running along the borders. It shows the Dover, Croydon, Greenwich, Blackwall, Eastern, North London, Great Northern and Birmingham railway lines and their termini.